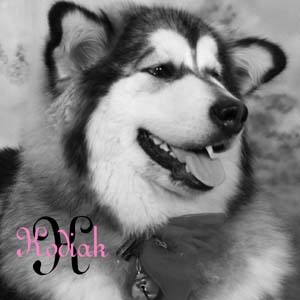 We are very excited knowing Kodiak will be featured on a past puppies page. She is so perfect. 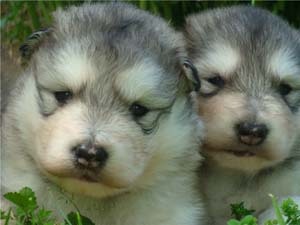 We hope it will encourage other people to buy puppies from Hudson's malamutes. 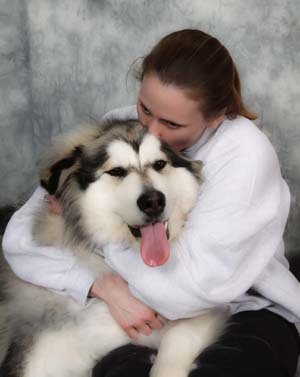 We are so in love with Kodiak. My husband raves about her mellow attitude and wonderful manners. We take her to a local dog park once or twice a week and Kodiak just steals the show. 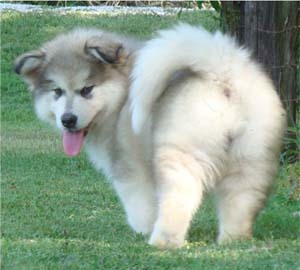 People have this overwhelming urge to pet her because she's so soft and fluffy. We took her to the fireworks on the fourth, at Fort Lewis, and she was great. She just sat there like okay I can handle this, no problem. A soldier noticed her as we walked up and he wanted to know how we got a license to have a bear. 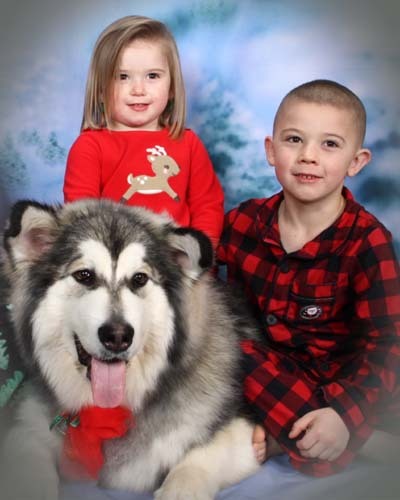 When we told him she is a alaskan malamute, he looked at us, in awe and said, "Ma'am, Sir, that is no alaskan malamute its a polar bear." 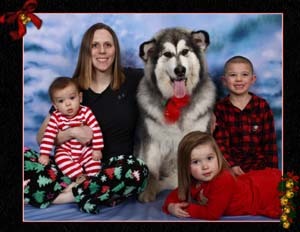 People can only laugh because while she's huge, their children run up to her and hug her. Children see her as giant, stuffed animal, not something scary. Its nice taking her places and people don't cross the street when they see our huge Kodiak, unlike our german shepherd who carries a stigma just because of her breed. If I have a particularly tough day, after my children go to bed, I lay on the floor with her and just run my hands through her coat. My husband says he swears he hears my sigh, like all the stress has just melted away and that's exactly what happens. While she is our family dog, my husband says he noticed a particular attachment to me. He says she loves us, but she loves her mama most. 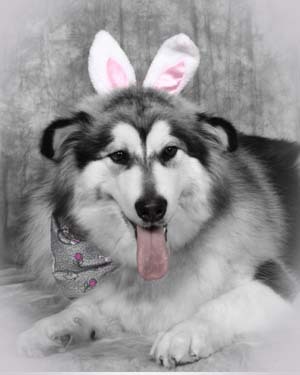 Kodiak may not have the medals or trophies some of the past puppies have, but she has our hearts and that's priceless. 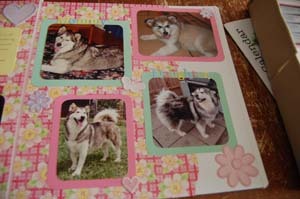 I wanted to show you the beginning of her scrap book. You don't have to send it to the web designer, its something we show every person who walks through our door. I've attached the beginnings just for fun. 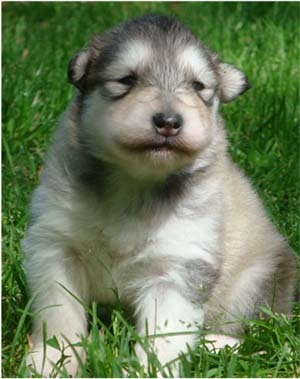 Also, I attached a puppy pic you listed on your website when we fell in love with her. I hope you sent this pic to your web designer. That picture said it all for us. Her smile was infectious. We knew after following your website for four years, she was the one. Again thank you for the best friend we all will ever have. God Bless and take care. 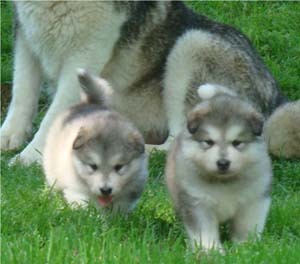 I just wanted to give you an update on Kodiak. 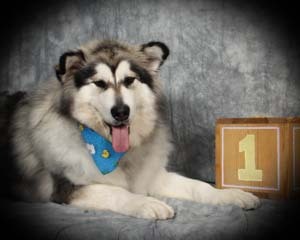 On April 8, 2012 Kodiak turned the big 1. 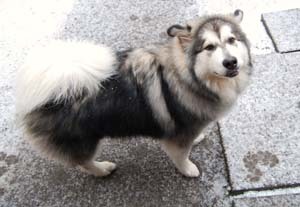 I had her groomed the day before and the groomer took over eight hours to brush and blow out her winter coat. The woman was sweating when I got there. 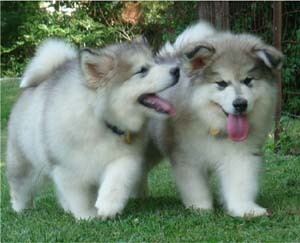 She said Kodiak is the most beautiful malamute she has ever seen. Its funny because in turn I usually say to people then you should see her parents. Jolene she's so perfect. I can't thank you enough. 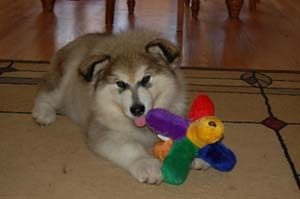 I've nicknamed her my brownie baked Alaskan malamute because she's so sweet. 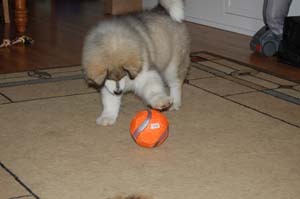 Here are some new pictures of her, we hope you like them as much as we love them. Thank you again. 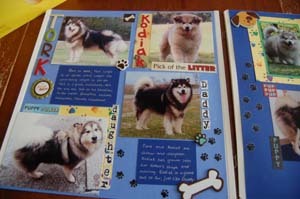 I'm really not trying to be a nuisance, but I was hoping I could get some pictures of Tork and Tawnie-T for Kodiak's scrap book. I pulled a few good ones of Tork off the website, but Tawnie's pictures kilobytes are too small so they blur when I try to print them as 4x6's. 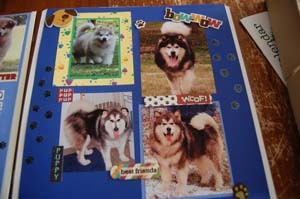 I assure you they are only being used for our personal scrap book of Kodiak. 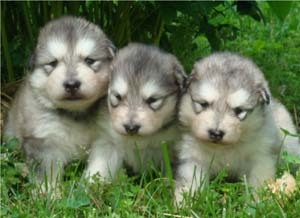 Its amazing how much of each parent she looks like. 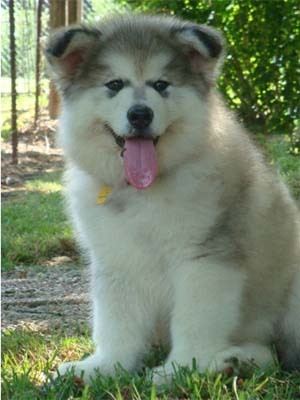 Kodiak has the sweet face of Tawnie-T and the burly, full body of Tork. Again we thank you for our girl. If you get a chance, we would appreciate some pics of Tawnie we can print. Take care and God Bless. 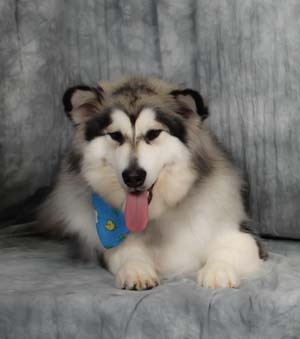 I thought you'd like to see 8 month old Kodiak a.k.a Fluff, daughter of Tawnie-t and Tork. We just wanted to say Happy Holidays and hope yours is great. As you can see we couldn't be happier with Kodiak. She's amazing and has been since the start. Kodiak is tipping the scales at 95 pounds and growing. She sleeps upstairs in our room with her own bed. Kodiak is afraid of heights so she won't get on our bed. She loves tennis balls and loves to just carry them around. 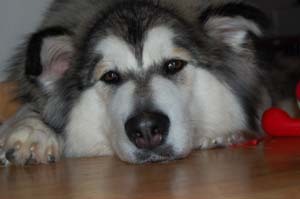 Kodiak also shares her bed with four cats. I've never had a dog who did so well with cats. She prances when she comes out of the groomer and in public, children line up to see her, like she's Santa Claus or something. Again thank you for our beautiful girl. Our Christmas will be more special. 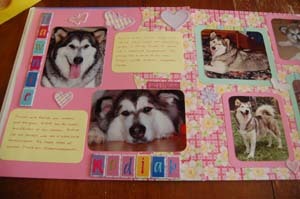 IFinally had a moment to send you an update on Kodiak. We absolutely adore her. She's perfect. On a few brief walks, people stop to tell us how beautiful she is and how big she might be. 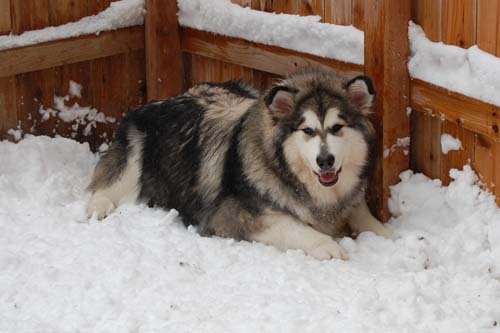 I guess in this state people are not use to malamutes. 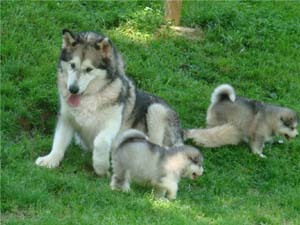 The husky is more dominant here. Folks keep confusing the two. Kodiak is really smart were finding out. She knows where the back door is to use the potty and comes when called by her new name. I've also taught her down and sit. She has lots toys. We discovered she liked baby toys and shoes, so we went to petsmart and loaded her up. Anytime she feels the need to take something that is not hers, we give her one of her toys. 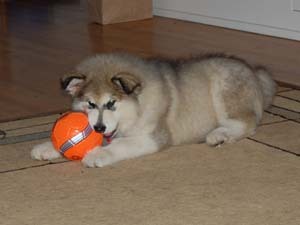 Kodiak loves to fetch. Who'd have thought. Tennis balls are rolling around all over here. Her kids love her. My daughter, Alex has taken a very special interest in Kodiak. She wants to take her every time we go someplace. 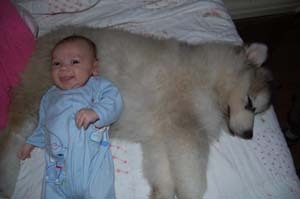 Alex says, "My Kody." She's already had a bath. We can't seem to keep her from soiling her kennel. Almost every time we've come home she's messed in her crate. I went to your website to get some solutions. We feed her three times a day as much as she wants during that time. We limit her water intake before she goes to bed. We take her out as soon as she wakes up, after we've romped we her, and thirty minutes after she eats. I'm not sure what else to do. Could her crate be too big for her? She's in a extra large crate that belonged to my German shepherd. We love her no matter. My husband calls her powder puff. I think she looks like the expensive end of a giant q-tip. My children call her fuzzy. Thank you so much for such a wonderful pup. I'll send updates as much as I can with pictures.